The World Health Organization is working to eliminate measles in at least five regions by 2020. There's some good news and there's some bad news when it comes to the worldwide fight against measles. The good news is in 2016, deaths from the disease fell below 100,000 worldwide, which is an 84 percent drop from the number of deaths in 2000. One major success story is the U.K., which was declared measles-free in September for the first time. And the World Health Organization estimates it's saved 20.4 million lives with its vaccination campaigns. But there's still potential for backsliding. Since 2009, the organization has only been able to get the first of two required doses of the vaccine to around 85 percent of at-risk children. That coverage needs to be at 95 percent to stop the spread of the disease. The WHO warns some of that progress could be reversed as polio is eradicated, since many of the countries with higher rates of measles deaths rely on the infrastructure in place that's meant to fight polio. And there's another factor: anti-vaccination activists. This year, Minnesota faced the largest outbreak of measles in years, at least in part because of anti-vaccine sentiments. 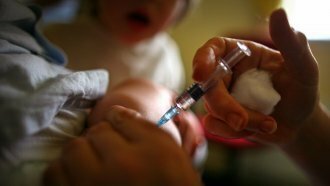 Starting in 2008, anti-vaccine groups targeted Somali parents in Minnesota who were concerned about the high rates of autism in children in the community. There's no evidence vaccines cause autism, and while vaccines can cause side effects in some people, they're generally considered safe. The WHO hopes to eliminate the disease in at least five regions of the world by 2020.